A rock and roller, feted by the Italian government and an avid aviator— V.N. 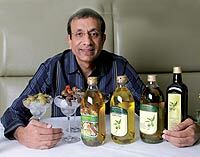 Dalmia, chairman of india’s biggest olive company, talks about all this, and more. Dressed in a blue Raghavendra Rathore shirt and white trousers, it’s hard to picture V. N. Dalmia, the lean and bespectacled 54-year-old Dalmia Continental Pvt. Ltd. (DCPL) Chairman, as the long-haired, headbanging musician that he once was. “I played the drums in the school and college rock bands,” Dalmia recalls, when we meet at Travertino, the Italian restaurant, at The Oberoi, New Delhi. “I even formed an Elvis Presley fan club, when in school.” But, he insists, he led a straitlaced life even then. For Dalmia, rock and roll never meant rebellion. “Except for the long hair and the music, I was quite dutiful as a kid,” he says. “My father, the group’s founder, firmly believed in practical training, and was keen that I join the family’s cement and biscuits business.” So summer holidays meant training at the group’s offices. But upon his mother’s insistence he was dispatched to college, which, he admits today, was “totally wasted”. He was far too busy with his music and his steady girlfriend. Right after college, Dalmia took over as Executive Director of Dalmia Dadri Cement. It was trial by fire. “Dadri Cement was a sick, troubled unit,” he says. “I had to formulate survival plans and deal with a lot of labour unrest.” But Dalmia Cement was soon taken over by the government as part of its revival plan, and Dalmia moved to the biscuits business, where he oversaw major expansion and revenue growth. Then he went to the US to do an MBA at the Darden School, Virginia, returning in 1984, to take the group in new directions, even venturing into tourism with Sunshine Travels in 1991. In 2003, Dalmia entered into a technology tie-up with the Italian company Nicola Panteleo, and launched DCPL’s principal product, Leonardo. The following year, DCPL launched Hudson Canola Oil and Leonardo Hazelnuts. It remains a pioneer in establishing the popularity and use of olive oil in India. And in recognition of this fact, Dalmia was awarded an Italian knighthood in 2006. He received the rank of a Commendatore (Knight Commander). The knighthood, titled the "Order of the Star of Italian Solidarity," was instituted in 1947 and honours Italians and foreigners for contributing to the development of friendly relations with Italy through language, culture and socioeconomic activities. Dalmia describes it as a humbling experience. “The greatest satisfaction comes from receiving an award that’s unsolicited. You realise that you must have done something right”. His days are packed with meetings and presentations, and there’s no time left for his former hobbies. He was once a keen aeromodeller at college. But today, his modelling time has been replaced by rigorous workouts at the gym. “I am big on fitness, and have been following a high-protein low carbohydrate diet for the past two years,” he says. 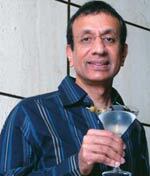 “I was weak and ailing in my forties, and feel revived and rejuvenated in my fifties,” says a proud Dalmia. “It’s all thanks to a strict exercise regimen,” he goes on. And thanks, in no small measure, to all those bottles of olive oil.